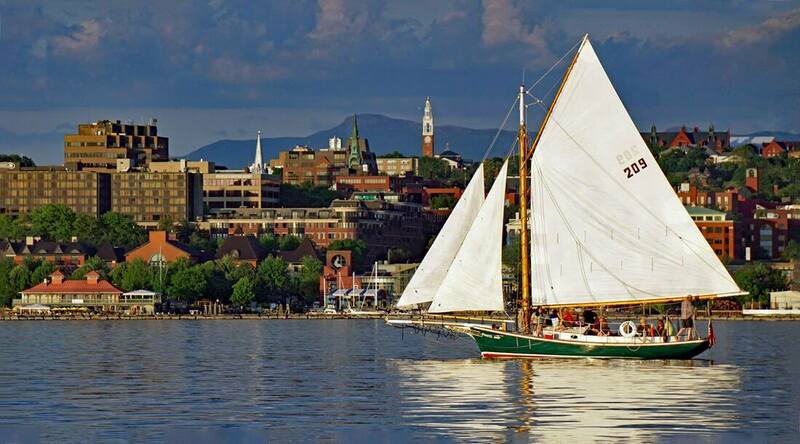 Nestled between the Green Mountains & Adirondacks, Lake Champlain under sail is the best way to experience Burlington. With the sound of the lake and wind in the sails, by day or by night, join us on a two-hour public cruise or private charter of Lake Champlain. Cruises include geological and human history, plus you're more than welcome to bring a picnic and beverages aboard! ​With our crew of experienced sailors, get to know Lake Champlain and relax with friends & family while immersing yourself in Vermont's charm and beauty. The team was so friendly, informative and entertaining. The sunset cruise was magnificently perfect. The local history and folklore was so fun and interesting. A definite must do on anyone's list of things to do while in Burlington. They are prepared for everything with blankets, fleeces, and they encourage you to bring beverages and snacks. ​Wonderful sail on Lake Champlain with friends. Captain Diddy and Hannah were the best crew! Organized, professional, and prepared. We laughed, saw wonderful views, took beautiful pictures, and enjoyed every minute. I highly recommend this company for any sail. There are a few boats that take people out on Lake Champlain but none have the charm of this gaff-rigged vessel. A quiet ride on a beautiful lake between the Green and Adirondack mountains is a must-do when visiting the area. You can also bring your own food and beverages including beer or wine. Whether you've brought lunch or are sailing under the stars, each sailing cruise on our vessels is an intimate way to experience Lake Champlain. Our Friendship sloops are traditional sailing vessels and are the only ones of their kind to offer cruises on Lake Champlain. Our knowledgeable crew will entreat you to a variety of stories, legends, and sights that make this region so unique. Bring beer, wine, or whatever you'd like to make our cruises truly your own. We offer public and private daytime, sunset, and starlit Lake Champlain cruises throughout the spring, summer and fall seasons. Our ship and crew are rigged & ready for a variety of cruise options for you and your family.